Dieter&Thomas consists of the trendsetting duo of costume designer Dorothee Brodrück and fashion designer Karoline Lobeck. They’ve managed to incorporate their two big passions into their work: high quality handbags and western movies. You can bet if these gals were around during “Unforgiven” Clint Eastwood would have been donning one of their leather babies straight from the Dieter&Thomas Berlin studio. Every model is handmade, from first cut to dyeing to the last seam stitched, with names like “Giu La Testa“, “Billy The Kid“, “Lonesome Billy“, “Ringo“, and “Sundance Kid“. The permanently engraved motives are revolvers, pistols, handcuffs, scissors, keys, sunglasses, flip-flop, or pocket flask. 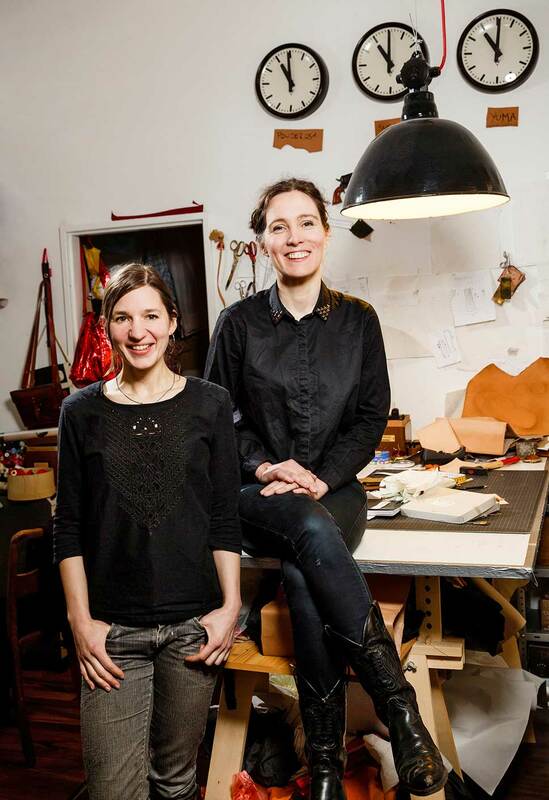 However, Dieter&Thomas also make special wishes come true: a broken violin for a violin maker, secateurs for a hobby gardener, a microphone for a singer or even the face of a love interest are just some of the custom products the two designers have created. Customers can choose between black, green, blue, red, and several shades of brown. Imagine your own one of a kind high quality bag, and Dieter&Thomas delivers after six to eight weeks.